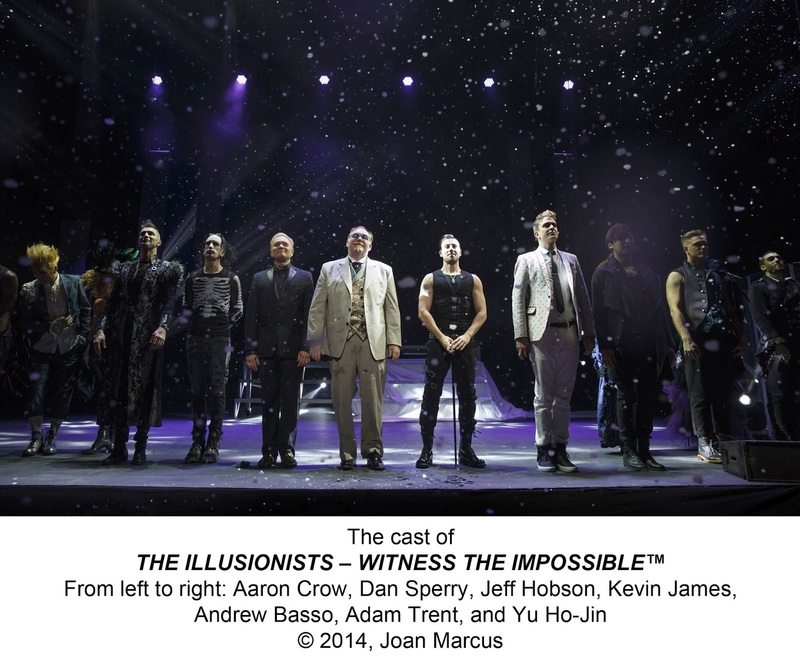 Last night, my husband Gabe and I saw The Illusionists - Witness the Impossible™ at Straz Center in Tampa. It was an incredible show which at times kept you at the edge of your seat or splitting your sides from laughing. 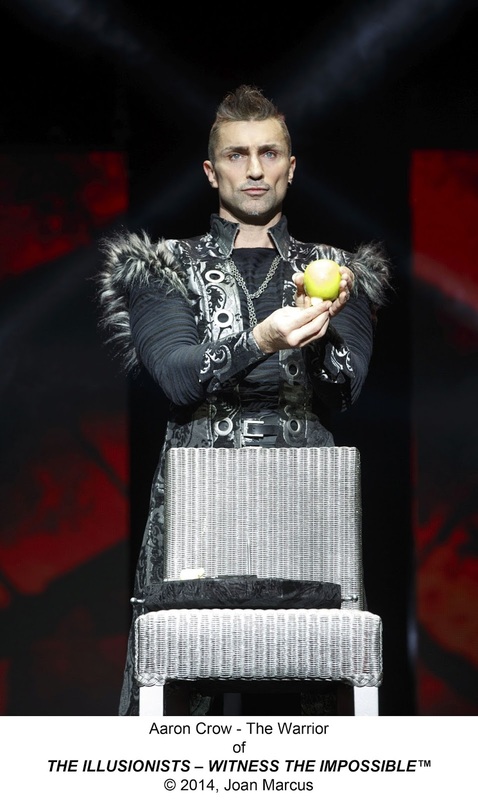 A mix of comedy, magic tricks, death-defying stunts and acts of breathtaking wonder, The Illusionists dazzled an audiences of all ages last night. Both Gabe and I are huge fans of America's Got Talent and it was great seeing this in person, as we both saw them on TV a few years back. The Manipulator, Yu Ho-Jin. Considered a rising superstar in the world of magic, Ho-Jin was recently named the 2014 “Magician of the Year,” by Academy of Magical Arts and was the first Asian to win the Grand Prix at the Fédération Internationale des Sociétés Magiques, also known as the “Olympics of Magic.”. At the end of the night, Yu Ho-Jin paid special tribute to the Tampa Bay Lightning with a "Go Bolts" illusion. The Anti-Conjuror, Dan Sperry. 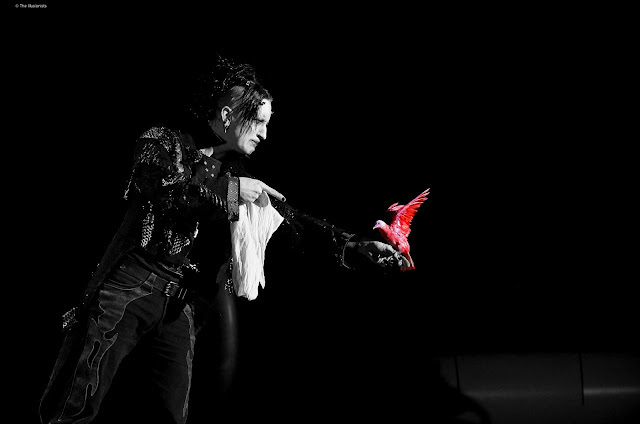 Described as Marilyn Manson meets David Copperfield, Sperry combines the art of magic with the macabre and is one of the top 10 most-Googled people, thanks to a legendary America’s Got Talent appearance. He was quirky, funny and scary all at the same time. The Trickster, Jeff Hobson. Hobson is the epitome of glamour and showmanship. Don’t be fooled by his innocent appearance, he has audiences laughing long after the curtain goes down. Jeff played with the audience and even stole three watches from viewers without their knowledge - he did give them back at the end of the night. The Escapologist, Andrew Basso. Italy’s star escape artist, Basso considers Houdini his hero and is fast becoming one of the world’s most popular illusionists. He is the only person in the world to perform Houdini’s famous Water Torture Cell with absolutely no covers. Andrew held his breath for over 3 minutes to perform Houdini's tower cell trick. The Inventor, Kevin James. Known for innovative illusions, James is an inventor, comedian and collector of the strange and unusual. He is one of the most prolific inventors of magic in the world and has created some of the most celebrated illusions of the last century. Kevin made it snow in the audience at the end of the night. The Warrior, Aaron Crow. A strong and silent type specializing in weapon magic, Crow has mastered some of the most dangerous acts without saying a single word. Belgium’s international magic sensation and a first place finisher at the World Championships of Magic, he uses swords, paintball guns and powerful crossbows to keep fans on the edge of their seat. Last night, we watched as he shot an apple off the head of an audience member. Her diamond wedding ring was inside of the apple and with a perfect shot, the ring was around the arrow on the target. The Futurist, Adam Trent. Trent shatters stereotypes and brings a new generation of magic to fans fusing technology, illusions, dancing and comedy with classic techniques. Adam performed a few tricks through the night, including a light show that left you wondering. The Illusionists - Witness the Impossible™ is produced by Simon Painter, Tim Lawson, MagicSpace Entertainment, Road Show Entertainment LLC and The Production Office. Conceived by Simon Painter, the show’s creative team also includes Executive Producer Tim Lawson, Director Neil Dorward and Creative Director Jim Millan. The Illusionists - Witness the Impossible™ is at Straz Center Tampa through May 31st and tickets range from $56-$82. Click here for show times and to purchase tickets.